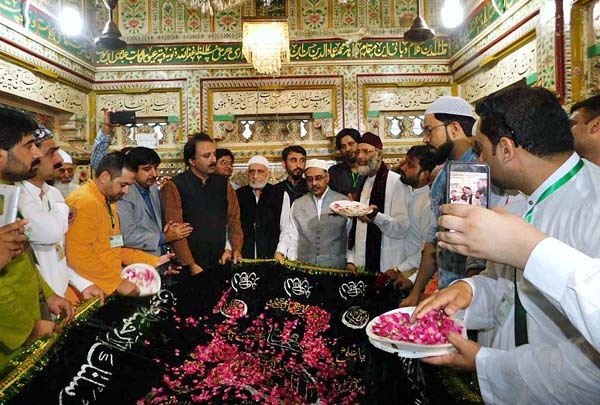 ISLAMABAD, Jul 3 (APP):Pakistani Zaireen (pilgrims), accompanied by High Commissioner Sohail Mahmood, Tuesday visited the shrine of Hazrat Amir Khusro (RA) in New Delhi, and presented the traditional chaddar on behalf of the government and people of Pakistan. A group of 165 Pakistani Zaireen was visiting New Delhi to participate in the 714th Urs of Hazrat Amir Khusro. High Commissioner Sohail Mahmood and the group of Pakistani Zaireen were greeted at the Dargah by Sajjadah Nasheen Dewan Tahir Nizami. Dewan Moosa Nizami and other members of the Dargah Committee were also present on the occasion, a message received here from New Delhi said. After laying the traditional chaddar at the shrine, the participants offered dua. Afterwards, the High Commissioner and Zaireen paid their respects at the Dargah of Hazrat Nizamuddin Aulia (RA), located in the same compound. Later, the High Commissioner had a session with Pakistani Zaireen as well as the accompanying officials from the Pakistan Ministry of Religious Affairs and Inter-faith Harmony. The Urs of Hazrat Amir Khusro, mystic and a spiritual disciple of Hazrat Nizamuddin Aulia (RA), is celebrated every year with traditional zeal and fervour, and is attended by devotees from different parts of the world, including Pakistan. The pilgrims’ visit takes place within the framework of the 1974 Pakistan-India Protocol on Visits to Religious Shrines. Hazrat Amir Khusro was a great Sufi musician, poet and scholar of South Asia. He was profoundly devoted to his murshid Hazrat Nizamuddin Aulia (RA). Hazrat Amir Khusro is also regarded as the “father of qawwali” as he fused the Persian, Arabic, Turkish, and South Asian musical traditions to create the form of Sufi devotional music. Speaking on the occasion, High Commissioner Sohail Mahmood highlighted the role of Sufi saints in the spiritual and cultural journey of the people of South Asia. The High Commissioner expressed gratification that this group of Zaireen from Pakistan was able to visit New Delhi to pay obeisance. Noting that the process of imbibing from the teachings of Sufi saints and visiting their shrines had been going on for centuries, he hoped that this tradition would continue for all the years to come. During the dua, Dewan Tahir Nizami also prayed for the betterment of ties between the peoples of India and Pakistan.